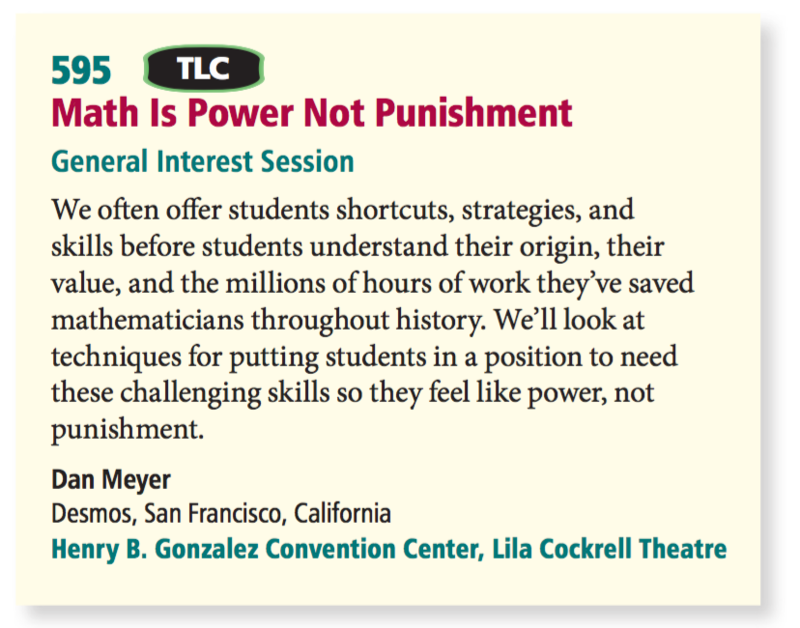 Glancing through the NCTM Annual program, I could almost feel my arms and legs being pulled in no less than 4 directions for any given session timeframe. Respected colleagues in our community shared their expertise and I’m thankful to have had the opportunity to learn from so many folks who continue to do great work. 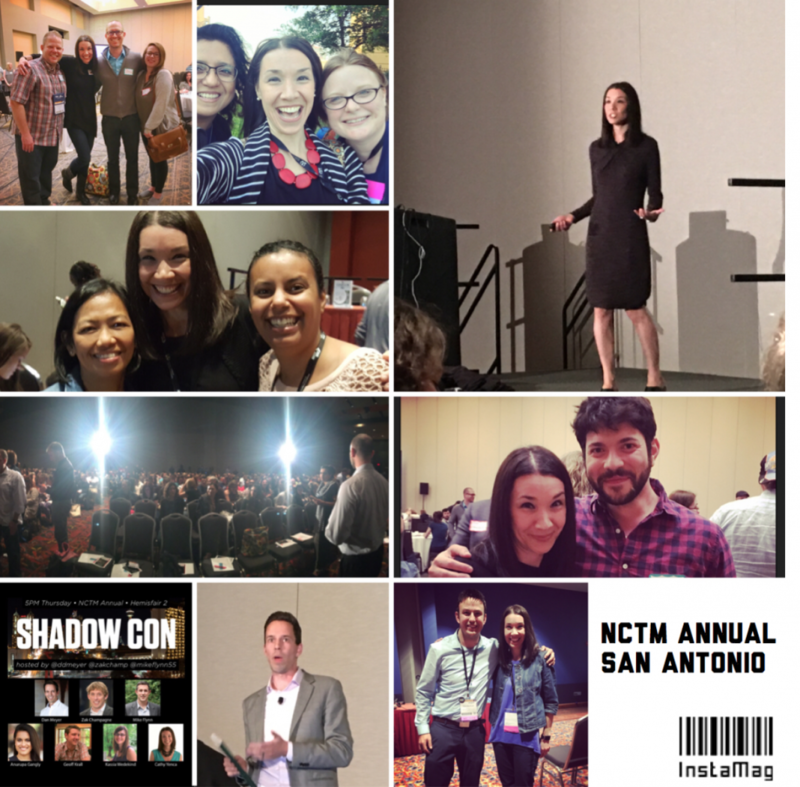 Here are some highlights from my experiences in San Antonio. 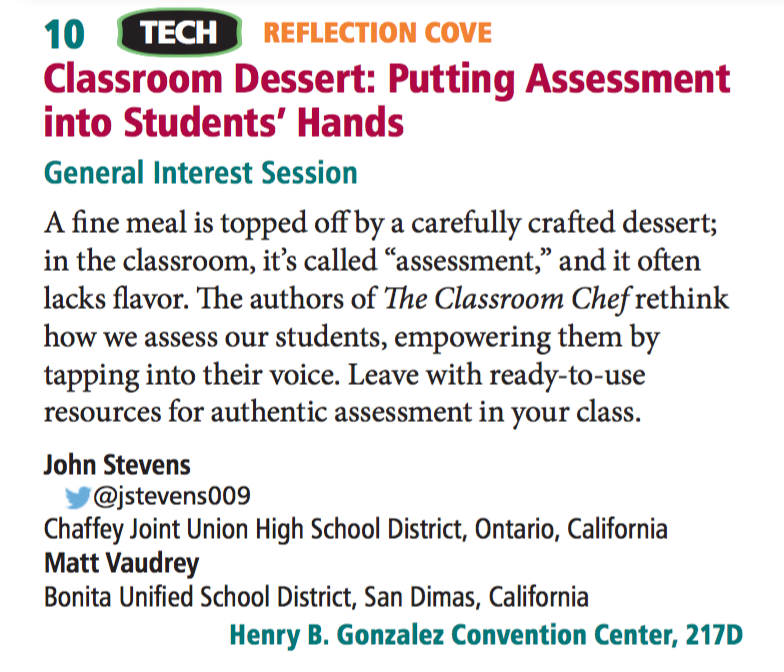 John Stevens and Matt Vaudrey showcased alternative ways to assess student understanding by encouraging student choice. Whether students preferred to show what they know through a paper-pencil task, a creative video, or a work of original art with accompanying written explanations, student work-samples featured unique ways to arrive at the same goal – learning! 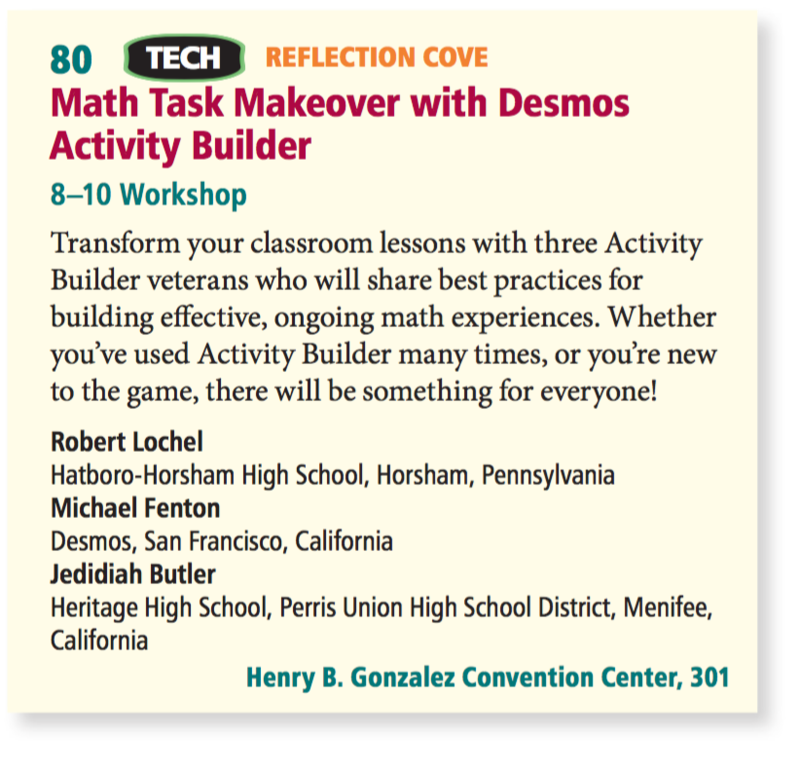 Bob Lochel, Michael Fenton, and Jed Butler provided before-and-afters of some all-too-familiar textbook spoilers and worksheet ho-hums such that Desmos Activity Builder up-leveled student experiences! Check out the latest support resources for teachers at learn.desmos.com/create and a visual summary of the session through one of many amazing sketch notes shared by Karen McPherson! 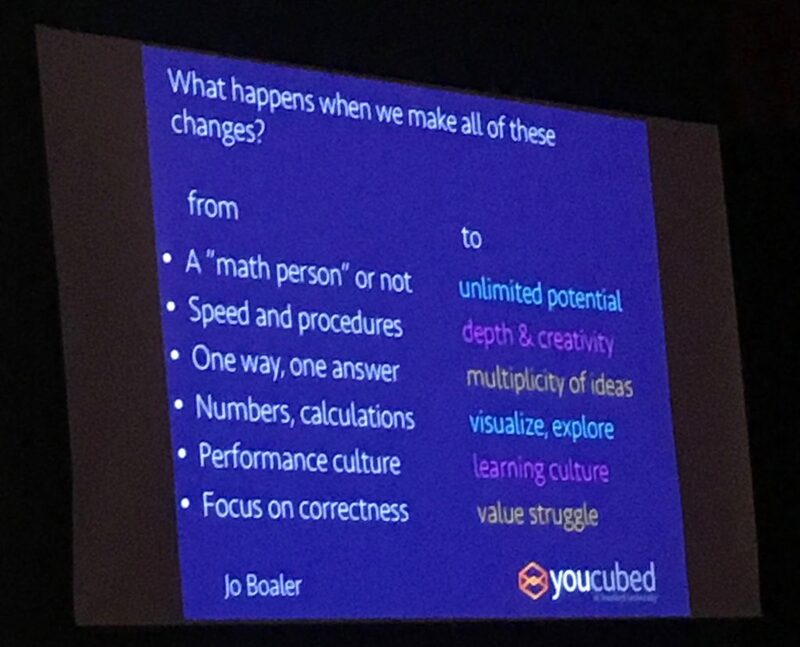 Jo Boaler continues to press on with her math revolution! I was thrilled to hear her speak in person, and I think my neck is still a bit sore from nodding in agreement with her philosophies and findings. Visit https://www.youcubed.org and be prepared to spend a few hours there. 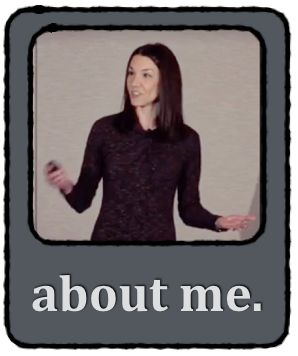 Check out my favorite slide from her talk below. 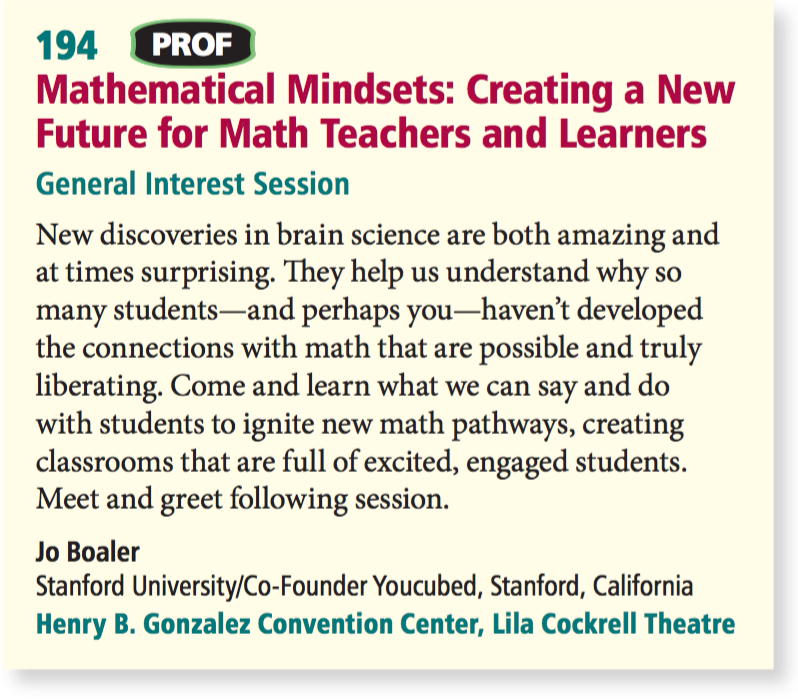 Looking Forward: What’ll Be Possible in Math Ed in a Decade? Eli Luberoff, the CEO and Founder of Desmos, emphasized the importance of our students’ ability to solve non-routine problems as we dive into future careers. 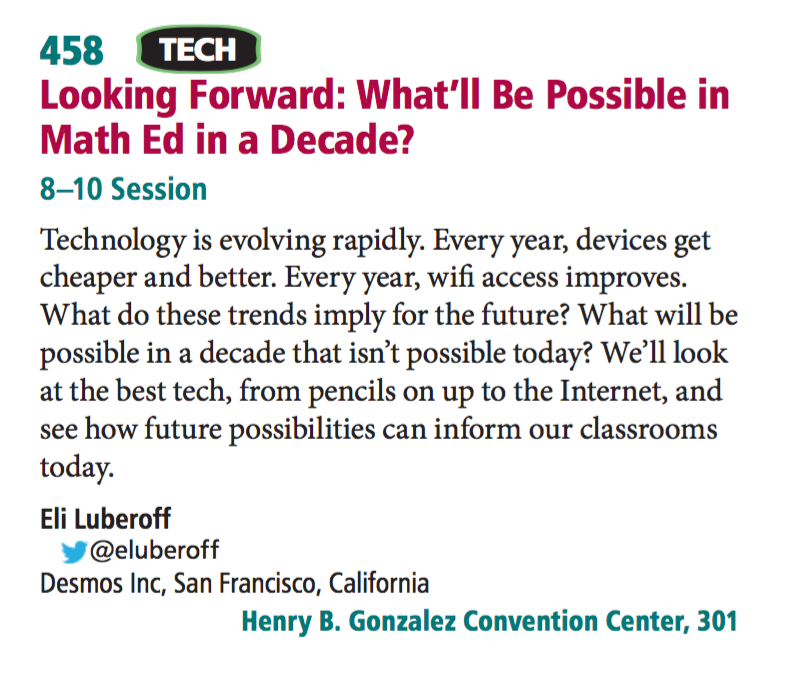 Eli addressed the purposeful use of technology in our math classrooms to assist our students in preparing for their own futures, even claiming that our math classrooms are one of the most important places on earth! Feel the weight of that honor and responsibility for a moment! 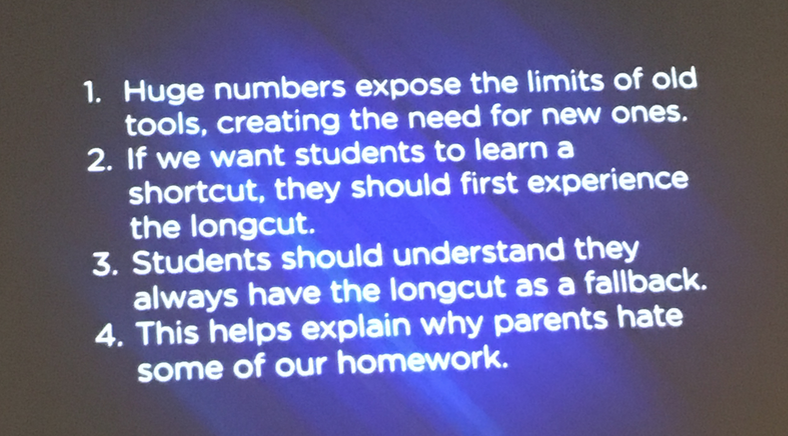 Additionally, Eli proposed the use of a tool like Desmos Marbleslides to meet unique differentiation needs of our students because of the “low floor, high ceiling” nature of these tasks. Finally, in WWDC-Desmos-Style, Eli let us play with the latest and not-yet-final-draft of the new Desmos Geometry construction tool at desmos.com/geometry. I wish I could have recorded the audio of the attendees during this time. There were oooo’s and ahhh’s and even moans and groans of delight as teachers began imagining how this tool will change the ways students explore geometric concepts. Fun fact: Our live Nearpod session code was GIJOE. I thought for sure someone at Nearpod was messing with me, and had created that code intentionally. It turns out, the code was generated randomly. The probability of that happening is (1/26)^5 folks… or as a decimal… Perhaps I should go buy a lottery ticket. Dan Meyer used Guershon Harel’s paper as inspiration to pursue the idea of creating the “intellectual need” for the mathematics we explore with our students. I’m pretty positive we’ll have a video of this talk to share later. You know Dan – his talks can be tough to describe in a blog post. You’ll want to experience this one for yourself. (Will post a link later). Geoff Krall challenged us to think deeply about “productive struggle” and how we promote productive struggle to students who’ve been conditioned otherwise. Geoff’s take on the topic is that it takes a wholistic approach of three elements: Quality tasks, Academic safety and Effective facilitation strategies. 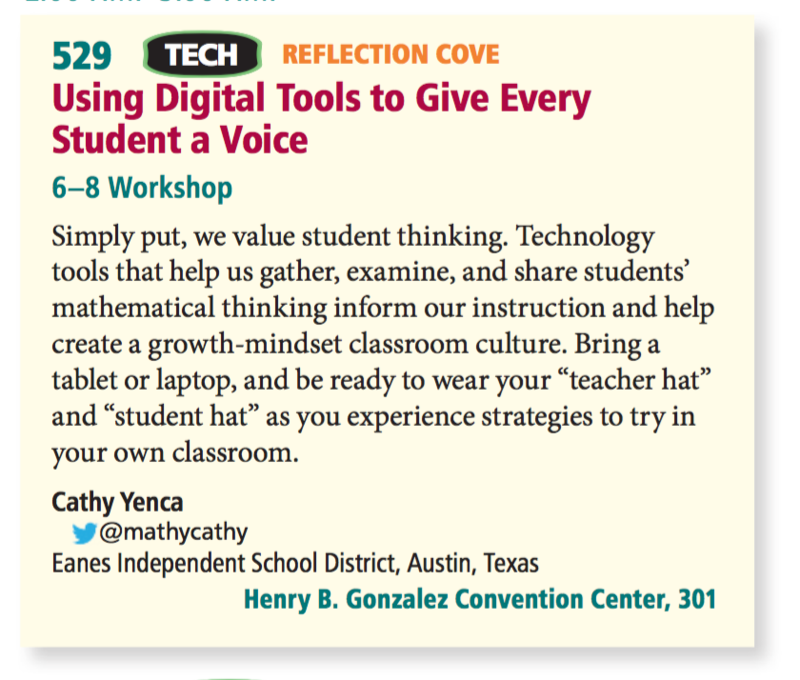 Visiting emergentmath.com is a great place for folks to find an abundance of quality tasks. 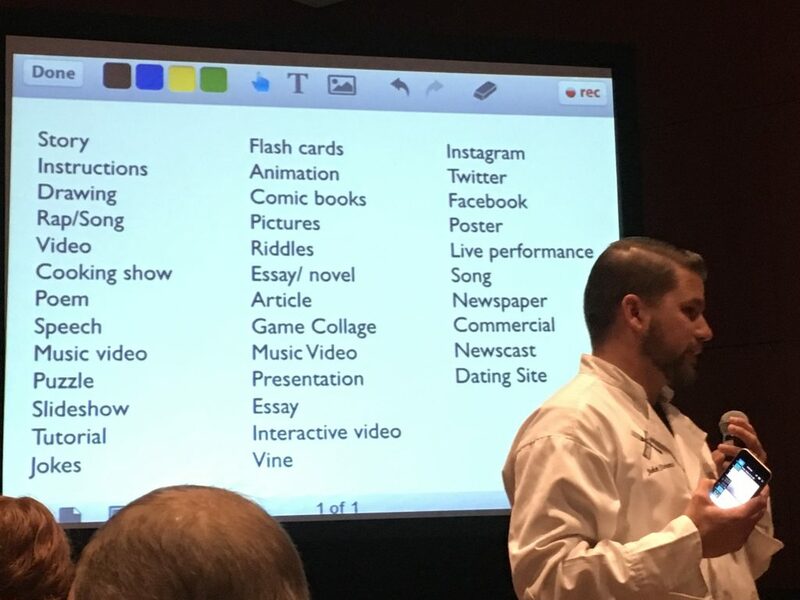 Additionally, we explored this Open Middle task in Geoff’s session and got surprising results that sparked conversations lasting beyond the session! One of my proudest moments to date in my 40ish years on the planet may well have been having the opportunity to share at #ShadowCon17. 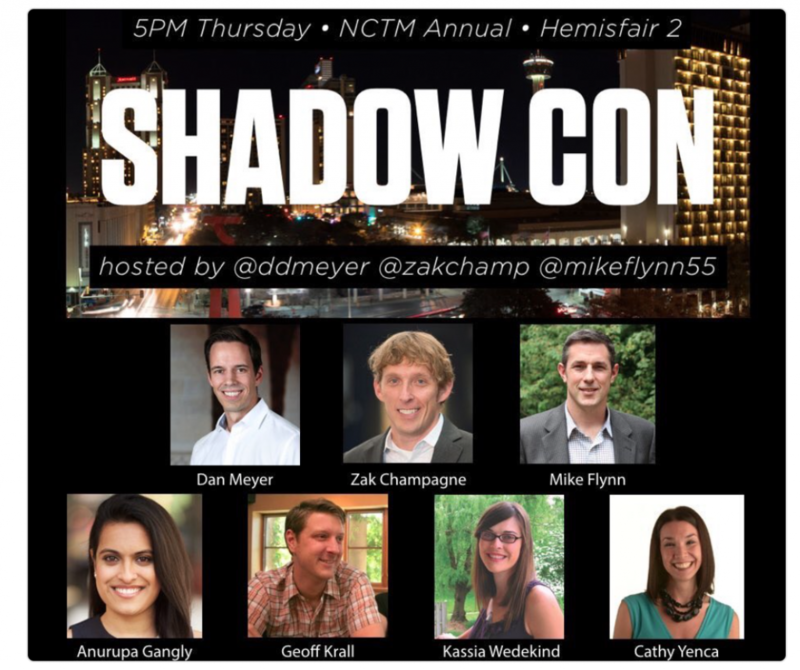 At LEAST a Sagan of thanks to Dan Meyer, Zak Champagne, Michael Flynn, and NCTM leadership for the opportunity and support you’ve offered to help us four Shadowcon-ers to prepare for this experience. 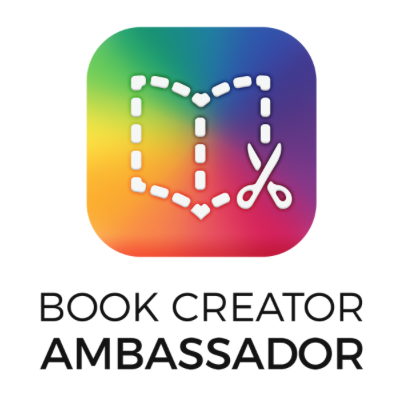 I look forward to continued work as we launch our free online courses this fall. Sign up here. 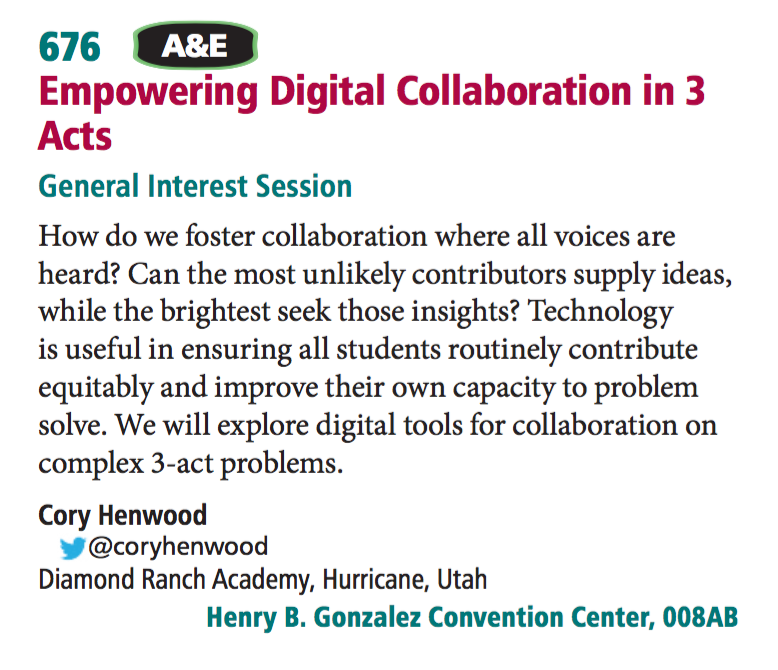 Of course we attend professional conferences to attend sessions and soak up the goodness like a sponge, but I would be remiss if I didn’t mention my favorite part of this conference: CONNECTING WITH YOU! 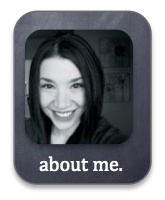 “You” includes so many familiar faces that, until this conference, I knew from a tiny Twitter photo and a vast collection of work through blogs and shared resources that have made my teaching practice and my students’ classroom experiences all the better. I can’t describe the feeling I felt when I first walked in to the #MTBoS game night on Wednesday evening and finally got to high-five and hug so many awesome folks in our community. I was so giddy, I had a hard time sleeping that night. I was overwhelmed with joy, humility, and frankly, as a colleague of mine, Nadine, describes the feeling… cognitive crushes, ha! I love your brains, I love your work, and I respect you immensely. 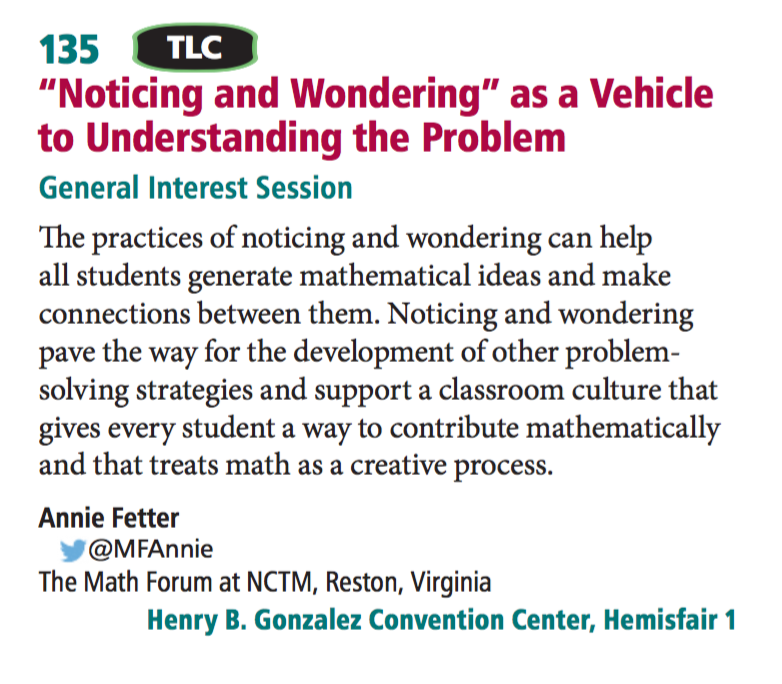 Check out another great NCTM reflection from Kim Morrow Leong here. Valuable presentation advice compiled kindly by Dan Meyer here. 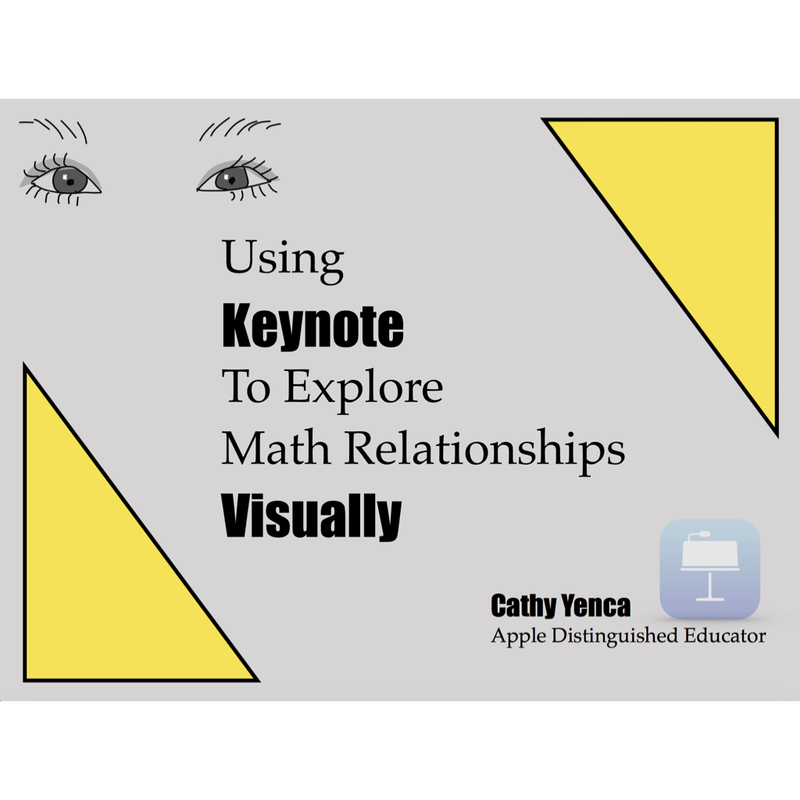 This entry was posted in Algebra 1, Pre-Algebra and tagged #MTBoS, #NCTM17, #NCTMannual, #Shadowcon17, Dan Meyer, Desmos, NCTM, nearpod, Twitter. Bookmark the permalink. I love the entire idea of notice & wonder because a) it gives everyone a way into a problem and b) it’s how real mathematicians actually think! 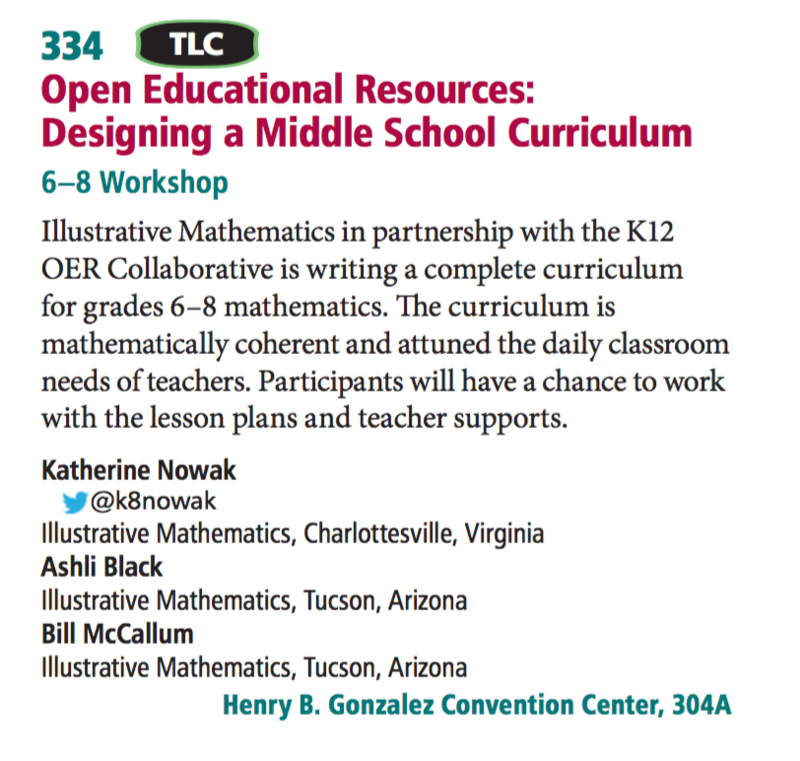 I’ll also be super interested to see what IM/OER ultimately comes up with — what I’ve seen so far has been quite intriguing.